At-home recycling plants might soon be available thanks to a new device being developed by a group of engineering students. No more transporting your plastic bottles and containers to the tip – recycling goods could soon be as easy as a trip to your own backyard. A group of Monash University students has developed a portable recycling unit that is compact enough to fit in the back of a ute. According to its developers, the device can recycle bottles and containers. The materials are broken down by the machine and converted into any mould-based design, such as phone cases, bowls or building materials. New stories about the negative effects of plastic on the environment emerge almost daily, and more businesses and consumers are looking for alternative ways to dispose of single-use plastics like bags and bottles. “It would be the dream for everyone to be able to recycle their own plastic and reduce our waste,” said project materials manager and engineer Gabi Newman, who helped develop the portable recycling plant. The integration unit of recycling machines in its transport mode, all packed up within a 1×1 m area. First, the device shreds plastic into pellets, which are then melted down. From there it can be passed through an extruder to make 3D printer filament, into a compressor to make bowls or structural beams, or an injector to squeeze the plastic into moulds. “We can make any product that’s made from a mould – so that means bowls, phone cases, we can even make gears,” Newman told the ABC. She added they plan to add laser cutting to the mix, which “unlocks numerous potential to make a whole range of products”. 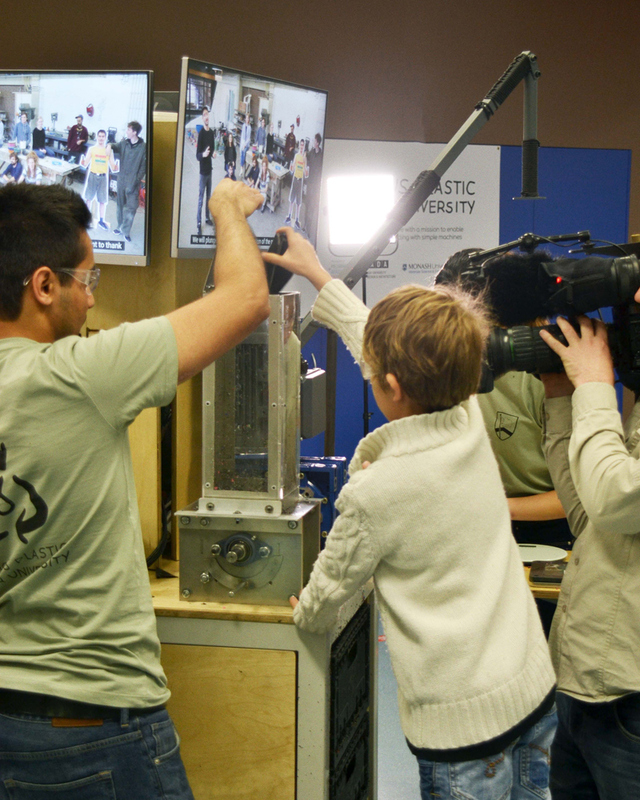 The mini-recycling plant was developed as part of the Precious Plastic initiative, an open-sourced recycling project that encourages everyone to create their own plastic recycling facility. Academic supervisor Dr Scott Wordley presented the idea to the team of Monash students and encouraged them to further develop the open source machine blueprints. “He challenged us to modify these existing machines with the aim of making them more compact, safer and transportable,” Project Manager Joel Ibrahim told create. The recycling machine has monitors and fold-out workbenches as well. According to Daniel Kobiela, the manufacturing manager, their modifications had three main design constraints: safety, reliability and transportability. “Being the first iteration of these machines, we aimed for simple, modular designs, which in turn led to low-cost manufacturing,” Kobiela said. Teammate Anthony Ngo, product manager, said these challenges provided the group a unique opportunity to gain a range of skills outside the typical university experience. “We conducted interviews for team recruitment, ran computer aided design classes for the team, prototyped our concepts, and outsourced materials and components before transitioning to the manufacturing stages of this project,” he said. 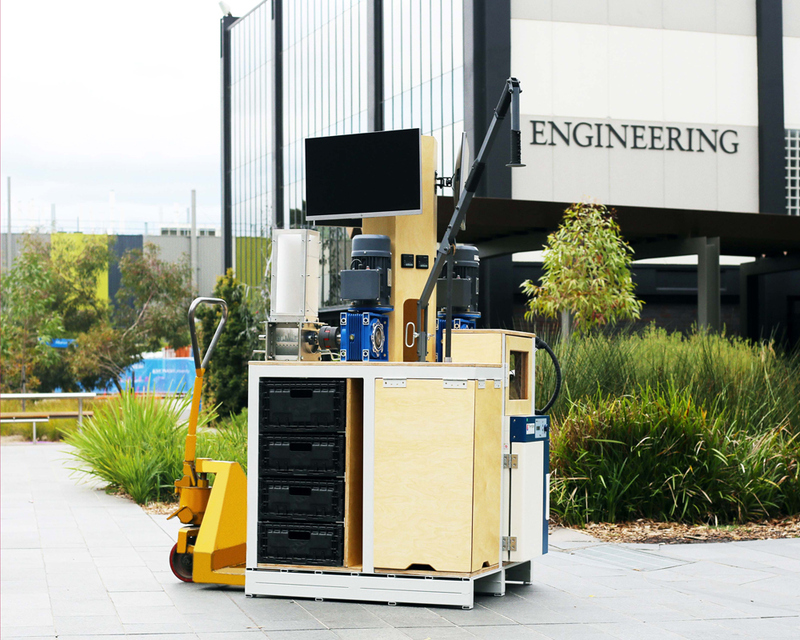 Monash University Dean of Engineering Elizabeth Croft said this device is a perfect example of the ways engineering students can work on projects that solve real-world problems. “All the daily products that use plastic – why can’t we take the waste and turn it into things that are useable, structural things? Day-to-day use things,” she said. That’s exactly what the students hope to encourage. The idea is to eventually take it around to schools and workplaces to raise awareness about the importance of recycling plastic. Ibrahim said he imagined schools and offices using the device to create common supplies like rulers and paperclips from plastic waste. A number of primary schools and companies have already reached out to the team asking if the recycling unit can come by for a demonstration. 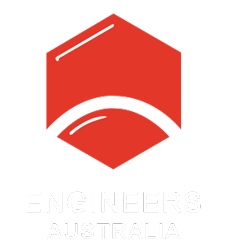 Precious Plastics Monash, composed of undergraduate and master’s students from a variety of engineering and industrial design backgrounds, will continue to develop the unit through further testing and tuning. “We intend to continue improving our current machines. Additionally, we will focus on refining the products that are produced from these machines and engage with the community about plastic recycling through outreach programs,” said Nicholas Lim, engagement manager.